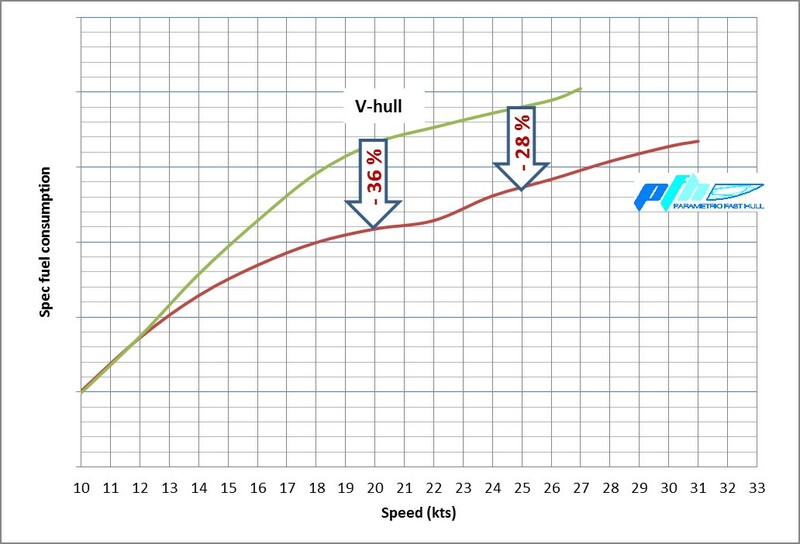 The pfh is a new hull shape for low power requirements at high speeds. We have found typical power reductions of 30% compared to conventional hulls. pfh is suitable for Yachts of all sizes, patrol boats, corvettes and fast ferries. pfh is also suitable for planing catamarans. Significant reduction of fuel consumption in a large speed range. Be there with the same amount of fuel in 30% less time. The Computational Fluid Dynamics (CFD)-Calculation of the bottom pressure showing suction forces at the bow (blue) and pressure forces at the stern (red). The suction below the forward part of the hull and the pressure force at the stern oppose the strong trim moment when passing from displacement to planing operation. 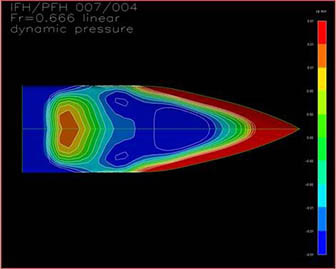 This pressure distribution is effected by a convex shape of the forward part of the hull and the concave shape of the aft part. A flat stern creates maximum lift. The resulting shape is very simple and facilitates the mathematical description of its geometry by very few parameters. This is an important prerequisite to allow effective numerical optimisation with evolutionary algorithms. The simple parametric description gave this new hull shape its name: Parametric Fast Hull. Numerical prediction of the pressure distribution is necessary because the impact of geometry, flow and pressure on the resulting resistance of the hull shape are beyond the direct intuition of hydrodynamic experts. The conventional ship trims stern down during the transition to planing as it tries to climb its own bow wave: high resistance, high wave wash. The pressure distribution of the pfh bottom counteracts the stern down trim. There is no resistance peak. Frictional resistance results in behaviour similar to displacement; wave resistance and wash are minimal. Power requirements increase according to the same characteristics as in a displacement vessel. This is favourable for propeller design and loading of the propulsion system. pfh is particularly suitable for Froude's number in the range 0.6 to 1.5. Depending on the application, in particular the length to breadth ratio, there are further advantages at higher or lower speeds. Despite the flat bottom of the pfh excellent manoeuvrability is maintained. The key elements here are a hard chine with integrated spray rail and concave sections in the stern. This also ensures excellent dynamic stability around the longitudinal axis and very low heel in a turn. Seakeeping is similar to V-shaped hull profiles, as the forward part of the shape can be designed to match relevant requirements. pfh offers further advantages beyond this as the dynamic trim at high speed is lower than with conventional shapes resulting in lower vertical accelerations in a given sea state. The pfh shape for a special application was model tested to highest speeds in a model tank. An untethered model with waterjet propulsion was used for testing directional stability and manoeuvrability in calm water and in a seaway. The predicted performance of pfh has been verified in several projects.